Introduction EMSL Analytical provides testing services, sampling supplies and easy-to-use test kits to identify indoor exposure concerns following property damage. Last month, The Lancaster News published an article about a lightning strike at a church in South Carolina. The lightning reportedly struck the church steeple resulting in a fire and while firefighters were able to extinguish the fire within 45 minutes, the building was left with fire, smoke and water damage. Property damage due to lightning strikes during the summer is an all too common occurrence. 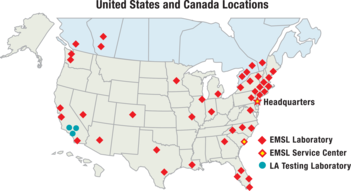 In fact, the summer season is the most dangerous time for lightning strikes in North America. The Insurance Information Institute reports that as recently as 2014 there were almost 100,000 paid homeowners’ insurance claims for insured losses in the United States alone. Helping property owners, tenants and property managers identify these and other indoor environmental quality (IEQ) issues are the experts from EMSL Analytical, Inc. They offer testing services, sampling supplies, easy-to-use test kits and building inspection tools to identify smoke residues, odors, water damage, mold, lead and asbestos. EMSL has even sponsored an educational video about property damage and IEQ issues following a lightning strike that can be seen at: https://youtu.be/nczGPb5rReU. To learn more about indoor environmental quality testing services, please visit www.EMSL.com, email info@EMSL.com or call (800) 220-3675. To access IEQ test kits, visit www.EMSLTestKits.com.